Our 8th Year! Our Next RIDE Cymru event will be May 2-6 2019. ...An adventure on your doorstep... Clinging to the welsh side of its border with England as tightly as public highways shall allow. Hugging the coastline as practical as possible, the ultimate motorcycle tour ride of Wales - 'the shape of the nation'... 1070 miles of back lanes, the odd navigable track, the luxury of the odd stretch of 'A road...Visits & laps of the premier motor racing circuits of Wales.. Riders can opt to join us for as many of the 5 day sections as they wish, or join us for the full trip.. We appreciate work commitments, so fit the ride to fit you.. Raise over £100 sponsorship and you qualify for rider entry to the ultimate ride out around Wales.. 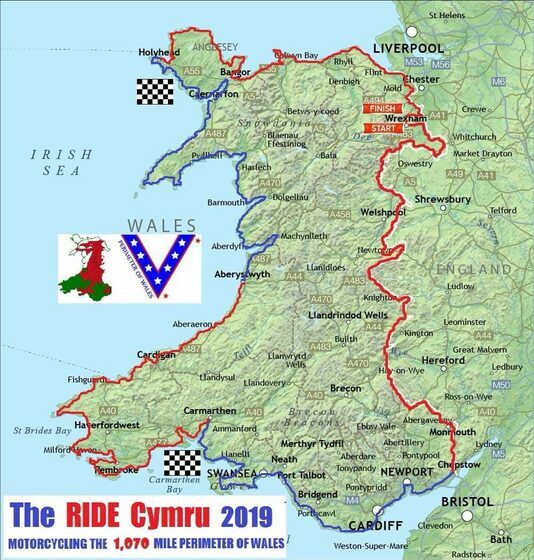 The 2019 RIDE Cymru 1000 will be our 8th annual 5 day charity motorcycle event around the 1070mile perimeter of Wales. Motorcycling each day for over 200 miles and up to 10 hours. The 2019 event will commence on Thursday 2nd May from Wrexham, in north east Wales. We complete the perimeter event five days later on Bank holiday Monday May 6th back in Wrexham at 4-30pm..
What types of bikes can do this? The perimeter route runs on mostly on paved roads. ALL TYPES OF BIKE CAN JOIN US, But we recommend Adventure style bikes are best suited. If you want further details please visit our FACEBOOK or TWITTER pages. If you wish to register for entry please READ ALL PAGES ON THIS WEBSITE FOR INFO and then email info@ridecymru.com with your full name, mobile contact number & full bike details. Please include name of your pillion rider if applicable. RIDE Cymru 2019 will witness for a 5th year the return of the 'Cymru Kneivels' theme as we continued to raise the profile of a fun charity event, and raise as much money as possible for charity. RIDE Cymru riders who have in past events raised over £300 for charity are given special mention & recognition by the event and Macmillan. 2019 - Thursday May 2nd we leave from the welsh border town of Wrexham, in north east Wales. Located six miles west of the border with England, we depart the town 9am to head to Holt is situated alongside the River Dee and we commence the 5 day 1070 mile perimeter of Wales event. Each day will see RIDE Cymru continue its perimeter route with the added feature of visits & laps of 3 Motor Circuits, Kinsham, Pembrey and Anglesey Circuits. Please pick which day suits you best and join us!! Day 2, 3 and 4 commence at 9am, and will include an average of 9 hours riding to our next destination. The evening destinations on our 2017 event will be Monmouth, Carmarthen, Aberystwyth & Holyhead. On our final day 5, the bank holiday Monday, we leave Holyhead at 10am and finish back at Wrexham at 4-30pm. This is by no means a speed trip, we are not hooligans. Honest! 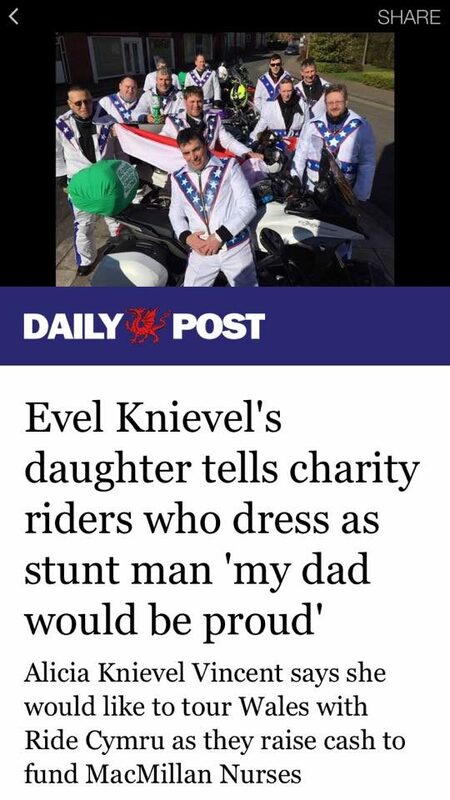 We ride to promote a good name for motorcyclists. We ride in a controlled manner in a proven 'drop off' system. No riders are left behind, lost or stranded. We have a support vehicle to assist mechanical problems. RIDERS are responsible for arranging their evening stops. 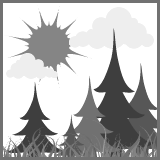 A list of suggested campsites or B&B's are provided for each rider to plan their accommodation. We meet up later at each evening destination to share tales of the days ride. ...Our perimeter of Wales includes visits & laps of Pembrey & Anglesey Circuits. Many thanks to the officials and management of all circuits for kindly continuing their support of RIDE Cymru. In 2013, 2015, & 2016 our event included a meet up for a chat and pic opportunity with World record holder globe trekker Nick Sanders at his Expedition Centre! 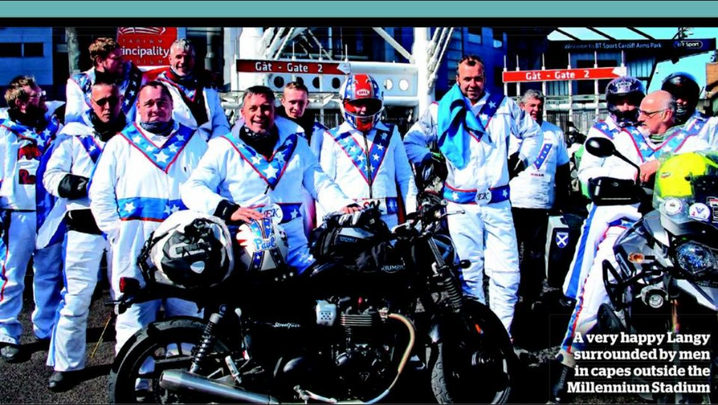 2017 included Cymru Knievels being joined by Dave Hailwood (son of legend Mike Hailwood), TV actor Danny John-Jules & TV Producer Steve Keys. 2018 we took a break from RIDE Cymru to undertake RIDE Capitals - visiting Knockhill Circuit, Olivers Mount Circuit and the famous Brooklands Circuit & Museum. Enroute we were joined by legends John McGuinness and Steve Parrish, and TV's Ruth Wignall.